In celebration of National Adopt a Shelter Dog Month, I decided to share a little bit about my two shelter dogs back home. Meet Montie (left) and Sasha (right)! These two both came from Double Dog Rescue, a dog rescue based in my home state of Connecticut. Basically, this organization transports dogs from high kill shelters in the south to places up north where they’re more likely to be adopted. Montie and Sasha ended up being my family’s two foster fails out of the 16 total dogs we fostered in a span of two years. Montie was the first one to steal our hearts. He came into our lives towards the end of January of 2015 and was our third foster. This is one of the first pictures that I have of him. I mean really, look how cute he is! Although we’re not 100% sure what kind of dog he is, we have our suspicions he may be a Flat Coat Retriever/Border Collie mix. What we do know is that he came up from a high kill shelter in Tennessee. Montie was the first dog we could really see ourselves keeping and it led to a lot of debate in the house. We weren’t sure if we were ready to have another permanent dog in the house or whether we should wait. In that couple of weeks though, Montie proved he was a good fit and ultimately, we decided we couldn’t say no. Many fosters later, Sasha came along. She’s a sweet girl that was transported from a high kill shelter in Alabama. She arrived in October in 2016 and it took less than a day for us to decide that she was meant to be in our family. I remember I had been at a birthday party and received a text from my mom asking how I’d feel if we decided to keep her. Honestly, it was a really easy decision for us to make. She immediately got along with Montie and everyone else in the family. This is a picture I have of her close to when we first got her with her alligator toy (Montie has a matching green one). We’ve had lots of debates about what kind of dog Sasha is. Our vet thinks that she’s a Hound/Cocker Spaniel mix. I know what you’re thinking, that little thing? Part Hound? Well, her bark begs to differ. It confused all of us with how deep and loud it was when she started barking at something for the first time. Personally, one of my favorite things about my dogs are the little quirks that they have. With Montie, he always greets people at the door with something in his mouth. Sometimes it’s something normal like a toy, but more times than not, it’s a shoe or a sock. Yes, you read that right. My dog greets me with shoes and socks at the door. Not only that, but he’ll try to bark with it in his mouth too. The funniest thing is when my mom comes home from work. She’ll sit down on the couch to take her shoes off and all of a sudden Montie will take off with one in his mouth and put it on her bed. Sasha’s little quirk comes out when she gets really excited. Sometimes she just can’t contain it and it honestly sounds like she’s a squealing pig. Now it’s usually my mom who gets this (although I got some squeals when I came home for winter break last year), but it never fails to make me laugh. Also, southern dogs are HUGE fans of Northeast winters. Both of them could spend HOURS outside and will even go outside just to lie in the snow. I don’t think I will ever forget the first time they saw snow. I don’t even think that they hesitated, but if they did, it was only for a second before they immediately took off running in it. If you throw snowballs for them, they’ll run to where the snowball landed and start digging in an attempt to find it. Sasha also tends to jump through the snow when it gets too tall for her to walk, which is the cutest and funniest thing to see. In the summer, they love to go for walks. Even though we have a huge backyard for them to play in, you say the “w” word and they’re over to you in a second waiting for you to put the harness on. Of course, if it’s just me, they have to go one at a time, so you always have one jealous dog barking and whining in the window. They love the trails by my house because they can splash around in the stream, drag me up hills (Mainly Montie does this), and just explore what’s around them. I enjoy it too because it gets me out of the house and I’ve actually discovered a lot of hidden gems that I wouldn’t have known about before. I remember one day Montie and I went for a long walk where we ended up by a lake that had a bridge over the waterfall by it that had “I love you” carved into it. I never would have found that if Montie and I hadn’t gone on that adventure. Montie and Sasha mean the world to me and are two of the best dogs a girl could wish to have. I can’t wait to see them in December when I go home because I know they’re going to be excited to see me after I’ve been gone almost a whole year. These two have also honestly changed my life. I gained a new passion for helping shelter dogs when we let these two into our family. There’s something really rewarding about helping a dog get a second chance at life and getting to know what love is after whatever has happened in its past to have them end up in a shelter. My dogs are the reason why I volunteer at the Lawrence Humane Society. If I can do anything to help dogs like them find their forever homes, I’m committed. 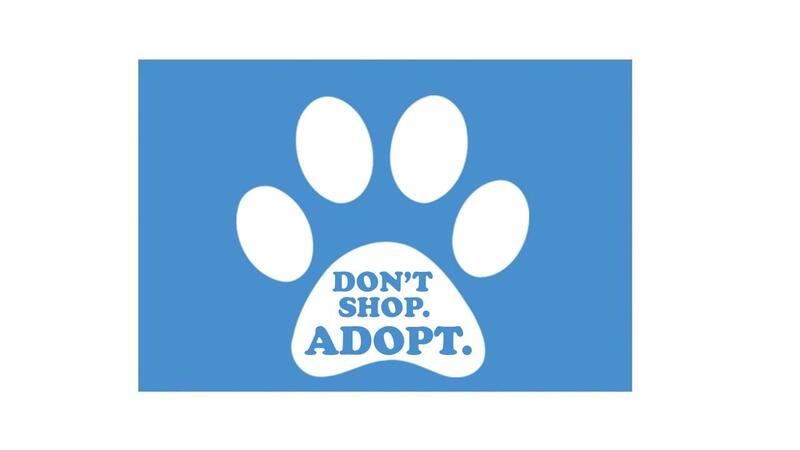 The fact that there’s a National Adopt a Shelter Dog Month warms my heart and I hope everyone tries to do a little something to celebrate.